Invasive species are a part of the fabric of the world. Well-mannered plants and animals in one country become thugs in another country or region for a variety of reasons. What follows is part of my report that appeared in the Garden Writers Association Quill and Trowel June newsletter. I’ve split the article into two parts because of the length of the original article. The second part, which presents invasive plant substitutes, will follow next week. Invasive is a word that many use to describe the plants that overrun our constructed and natural landscapes. Plants, by their nature, multiply in order to ensure their survival as a species. But what is the difference between a vigorous groundcover or colonizing shrub and an invasive plant? out-compete other plants and degrade native habitat. Unfortunately, many plants have been called invasive that really belong more in the “this is a pain to get rid of, but it can be done” category. Think of mint (Mentha spp.) or sweet woodruff (Galium odoratum). Yes, they spread, but they are shallowly rooted and can be edited from a garden quite easily. The three most significant traits of invasive plants are competitiveness, habitat degradation, and difficult-to-kill. Think purple loosestrife, wintercreeper euonymus, or water hyacinth. Fighting the spread of invasive plants is an ongoing task not only for gardeners, but also for state, federal, and international agencies and conservation groups. While eradication of invasive plants and restoration of ravaged habitats is the primary goal of these groups, the critical first step is “knowing the enemy”. It isn’t feasible here to mention all of the plants that are listed as invasive in the Midwest, but it is important to understand that invasive can be a regional concept. A plant that is invasive in Georgia (e.g. Japanese bloodgrass, or kudzu) may not be invasive in the colder areas of the Midwest. The ongoing effort to eradicate invasive plants might be compared to the labors of Sisyphus. The bottom line: do not purchase invasive plants, remove them if they are already planted, and choose wisely when creating the garden of your dreams. Part Two is a short list of invasive plants and some alternatives. Excerpted from an article published in the Garden Writers Association Quill & Trowel No. 3, June 2012. I was always surprised that Ohio nurseries had Lythrum salicaria on their availability list when I was buying plants for a large independent garden center. Indiana prohibits any Lythrum salicaria, even the supposedly ‘sterile’ ones, like Morden’s Pink. I told one salesman that he should put on the availability sheets that the plant was banned in Indiana. The nursery never did and Lythrum salicaria showed up every week. 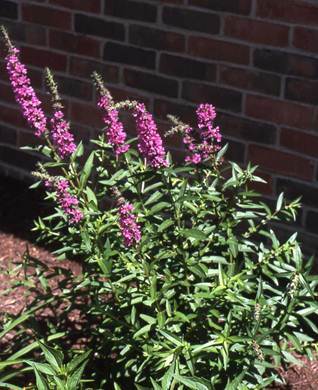 Purple loosestrife was planted in several beds in downtown Columbus, too, so I figure it’s not a banned plant in Ohio. Technically, the plants that are allowed to be sold in Ohio are the supposed sterile hybrids, not the straight species from Europe, L. salicaria. However, there are those – myself include- that say there are no sterile hybrids. I’ve done some research on this and here’s what I found: the cultivars of the hybrid with L. salicaria in the mix do not recognize themselves. In other words, they will not self-pollinate. It takes pollen from escaped plants (which essentially revert back to L. salicaria which seems to be dominant when seeds are produced) or pollen from a Different cultivar to fertilize a “sterile” cultivar. I have mentioned this countless times when designers have used it in the landscape. Fortunately, the different cultivars have been separated enough from different types, so many plants have not produced seeds. 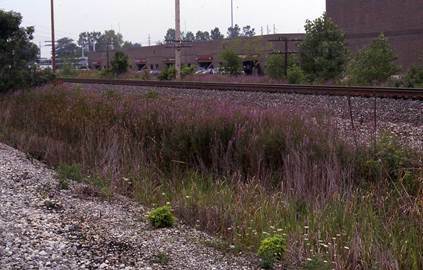 However, in the picture in the article, the plants that line the railroad right-of-way were not planted there. They are the seedlings of plants of different Lythrum genotypes that found each other. On the bright side, there has been research in Minnesota on several insects that eat Lythrum. I heard that the Lythrum population has been significantly decreased in the test areas. My question: what else do the insects that we have brought in from Europe like to eat?